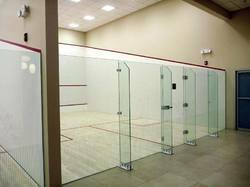 Providing you the best range of squash court back wall glass, squash court glass back wall and squash court glass wall with effective & timely delivery. Along with the Squash Court Back Wall Glass, all fixtures and fittings and other material requirements for the glass wall erection are available to us. The glass wall height is 2130 mm above the finished floor level, and we are the leading Manufacturer and Supplier of Squash Court Back Wall Glass. 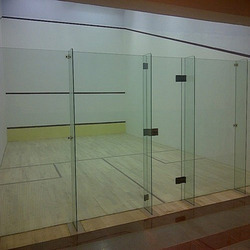 The Squash Court Back Wall Glass is free standing and it is made of 12 mm thick toughened glass with four panels. Added to that, the Squash Court Back Wall Glass also has one door and four fines. 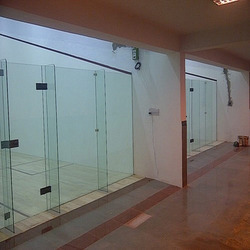 We are recognized as the industry leaders by manufacturing finest grade Squash Court Glass Back Wall. Along with the Squash Court Glass Wall, all fixtures and fittings and other material requirements for the glass wall erection are available to us. The glass wall height is 2130 mm above the finished floor level, and we are the leading Manufacturer and Supplier of Squash Court Back Wall Glass. The Squash Court Back Wall Glass is free standing and it is made of 12 mm thick toughened glass with four panels. Added to that, the Squash Court Back Wall Glass also has one door and four fines. Looking for “Squash Court Glass Back Wall”?